As the instructor told the reporter, the rules and regulations on drones and drone flight “are changing and evolving.” Federal Aviation Administration (“FAA”) safety guidelines ask operators to remain below 400 feet, obtain specific permission before coming within 5 miles of an airport, and obey temporary no-fly restrictions such as those applicable to active emergency sites, in the vicinity of Air Force One, and the during the upcoming Super Bowl (See the Know Before You Fly website, a private/public partnership, for more safety guidelines). Additionally, the FAA now requires registration of drones weighing between 0.55 pounds (250g) and 55 pounds (25kg). The $5 registration fee is waived through January 20. As the Tribune notes, there are also state laws and local rules governing drones including some that went into effect January 1. In California, drones cannot fly over schools that are in session and may not fly above prisons or jails. National parks and some local parks also prohibit drone operations, although exemptions may be available. Additional rules (federal, state, and local) may apply to commercial drone operators. 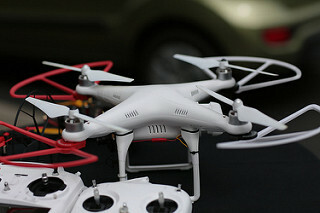 They may be marketed to hobbyists and even kids, but don’t mistakenly assume drones are safe. Accidents and close calls are piling up, including several incidents since our last report. On Tuesday December 22, a skier narrowly avoided being hit when a remote-controlled drone crashed just inches from the athlete who told CNN “This can never happen again. This can be a serious injury.” Less than a week later, a drone fell from the sky in Canada and hit a moving car causing damage but, thankfully, no injuries according to news organization CBC. The result was much worse in a case reported just prior to our last drone injury post where, per AOL News, a toddler was left blind in one eye when he was hit by debris from a drone crashed into a tree. Illustrating related risks beyond direct crash injuries, the Huffington Post carried the story of a UK reporter who injured his leg attempting to retrieve a drone that had fallen into a pond. Drones also pose a major threat to other aircraft operations, including commercial planes. An FAA press release notes that pilot reports of drone sightings jumped from 238 sightings in all of 2014 to over 650 reports between January 1 and August 9, 2015. Comparing sightings month-to-month, there were 16 reports of UAS sightings by pilots in June 2014, a figure that leapt to 138 in June 2015 and 137 in July 2015. Drones could potentially cause a tragic aviation accident, either due to a direct collision or as a result of evasive action to avoid a crash. Additionally, drones can impede the work of other flight operations, with the FAA noting that firefighters battling wildfires have been forced to ground operations due to UAS presence. We suspect drone accidents will only become more and more common as increasing numbers of civilians take to the sky. Drone accidents can impact operators or bystanders, including people on the ground and people in the air. We are here to protect the victims of this growing danger. The Brod Law Firm serves all of Northern California from our drone injury law firm in San Francisco, Oakland, and Sonoma. Call or use the online contact form for more information.